Being an web developer we might come across the term .htaccess file. Many of the web developers are talking about the .htaccess file. In this tutorial we will be discussing about the .htaccess file. .htaccess file is simple ASCII File written in the Notepad++ or using any editor. .htaccess file can be considered as configuration file which is used on web servers running on Apache. .htaccess is file extension rather than a file. .htaccess file is detected by the Apache Web server and all the configurations specified in the .htaccess file will be executed by the Apache server. .htaccess is file is used for enabling or disabling the certain features provided by Apache in order to fulfil the user requirement. 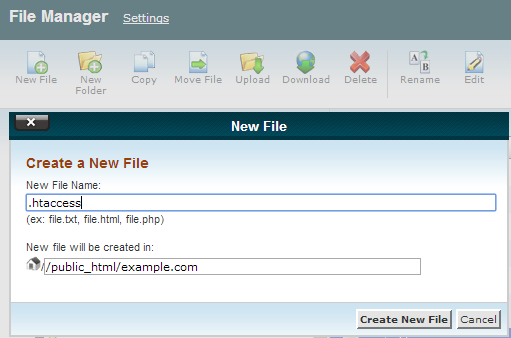 After the successful login we need to open the file manager by clicking on the file manager icon. Now after successful login we need to create the new file and provide the name as shown in the above screenshot.